Where the idea for velcro came from- the spiky round seed pods stick to clothing. 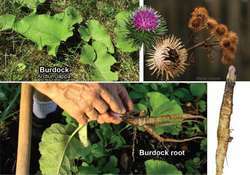 There are not many plants that can clean your liver, rebuild your blood and feed probiotics better than burdock root. Large rhubarb-like leaves. Reddish-purple thistle-like flowers. Very popular non-steroidal anti-inflammatory, antibacterial, anti-fungal, anti-tumor herb, strong liver purifier, detoxer and blood cleanser. Because it cleans blood so well, that makes it one of nature's great SKIN cleansers for acne, rashes, infections, psoriasis, eczema, etc. Removes acids from the blood. Helps remove heavy metals. Great for eczema, psoriasis, herpes, ringworm, even gonorrhea. Balances hormones, arthritic and gland problems. Very rich in minerals and trace minerals for bone, cartilage, tendon and ligament formation. It’s half inulin, a great food source for probiotics and intestinal gut flora. Only the very young leaves emerging in the spring are consumable. (blend in smoothies etc) Don't eat the big leaves- the root and seeds are the parts you want. You can make tea or powder with them. Slice up the root and cook on top of potatoes for super delicious meal, or dry, grind into powder and add to food and drink. You want the roots from the first year growth, not the older stuff which turns to wood and starts to decay. It's a biannual, just like wild carrot. Burdock Seeds have been used to help everything from flu to smallpox and scarlet fever. You can grind up the prickly seed pods into powder and add to food, drinks, or use fresh as a breakfast cereal, porridge or pancakes. Store seeds to sprout in winter for consumption. Seeds lower blood pressure by dilating blood vessels. The root gives you strength and vitality. Can be used like a carrot. The young flowering green or purple spike-pods can be made into an ointment and used on skin to effectively help clear up acne. Take a handful of the flowering spike-pods and put in oil (like olive oil), and let sit for a week. Then squeeze the plant so all the good stuff goes into the oil. What you are left with is a medicinal burdock oil to put on your skin. Meanwhile, take the seeds and root internally to help clean the body from the inside out, so you're hitting the problem from the inside and the outside at the same time. Of course you must stop whatever is causing the problem in the first place (bad food choices etc). Do not confuse burdock leaves with rhubarb leaves, which are poisonous. Burdock has purple-pink flowers and velcro-like burr clusters that stick to your clothes. Rhubarb has greenish white or rose reddish clumpy flower clusters. Young burdock shoots and small young leaves can be consumed, but not mature ones. Country folk would add Dandelions to Burdock to make a refreshing summer cordial and the stems were stripped in a manner similar to the Cypriot practice with the stems of Artichokes and consumed with salads. Burdock struck a fly--just beyond Carey--which Hines caught after a long run, ran to third base and put out Manning and threw to second, putting out Sutton and making a triple play. 2 Drain and add the sesame and grapeseed oil and saute the burdock and carrot till al dente, add 10ml of water to steam. The bewery's range also includes soft drinks such as cream of soda, ginger beer, dandelion and burdock, cherry and spiced apple. There's no burdock around our Carmarthenshire home, and no ransoms, an excellent wild garlic. Odds-compilers' views on the weekend action jjNeville Burdock, Sporting Index The injury problems at Manchester City could not have come at a worse time and I would expect plenty of goals when Chelsea go to Eastlands. One should eat only the roots from first-year burdock plants, which look like rhubarb with large spade-shaped leaves. Burdock, to begin with, for those of us who are unfamiliar with the matter, could you quickly explain what nanotechnology is? It brought back memories of the war years with Spam sandwiches, dandelion & burdock pop, and jelly and cakes with no sugar. It features a blend of pomegranate, stevia leaf, honeybush, burdock root, yellow dock root and red clover. The latter occurrences often involve introduced noxious weeds, commonly burdock (Arctium: Needham, 1909; McNicholl, 1988, 1994; Nealen and Nealen, 2000; Hinam et al.